Liz Wolfson of Clancy Systems International, Inc. is this week’s interview. Liz is Clancy’s CFO and also oversees the manufacture and distribution of the Denver Boot. Expo1000 - Can you give me a little history of Clancy? Liz Wolfson - Sure, Clancy Systems International Inc. was founded in 1984 to provide parking solutions – primarily parking ticket issuance and parking ticket management systems for city governments, municipal agencies, colleges and universities, and private parking companies. Expo1000 - What is Clancy’s relationship with the Denver Boot Company? Liz Wolfson - This Denver Boot is an important division of Clancy. It enhances the company’s offerings and provides a more complete parking enforcement solution. Expo1000 - Did Clancy invent the Denver Boot? Liz Wolfson - No. The Denver Boot was invented in 1953 by a gentleman by the name of Frank Marugg. Besides being an inventor, he was a musician with the Denver Symphony Orchestra, and a pattern maker. He was a friend to many politicians and police department officials in Denver. The Denver Sheriff's Department came to him to ask for help with their parking enforcement problem. Frank and the Sheriff decided to build a device to immobilize vehicles whose owners didn’t pay their outstanding parking tickets. He invented and patented the Denver Boot. Frank was quite a guy, he could build almost anything, he even made his own violin, which he played for the Denver Symphony. The Denver Boot was only one of his brilliant inventions. Expo1000 - When did Clancy acquire the Denver Boot Company? Liz Wolfson - The Marugg family ran the business from the start. Grace Berg, Frank’s daughter operated the business after his death. In 1986 we contacted Grace and began marketing the boot. Later we purchased the company from her and the Marugg family. Expo1000 - You say that it’s been in use since 1953? Liz Wolfson - That’s true. Expo1000 - As I look at the boot, it looks like it hasn’t changed. Haven’t the wheels and tires changed a lot since then? Liz Wolfson - While the Denver Boot works in substantially the same way, it has changed in many, many ways. Even though it looks similar, it has had pattern and design changes to accommodate cars with special hub caps, SUVs, and sport packages. Obviously, the cars in 1953 were all similar – they all had hub caps, the wheels and tires were all basically the same size. Now we run a gamut of everything from a wheel and tire that fit a Yugo to a Ford Excursion. The boot has changed – using different components that can be mixed and matched to fit all these vehicles. Expo1000 - Tell me about the boot you call the “Standard Boot”? Liz Wolfson - The “Standard Boot” will fit a car from a sub compact a standard size pickup truck – almost any vehicle with, what we call, a “standard type wheel and tire” and hub cap or alloy wheel. Expo1000 - How does the Denver Boot adapt to SUVs and 4 x 4’s? Liz Wolfson - The 4 x 4 hub cover is deep allowing it to fit down over the hub axle and onto a recessed or concave wheel. This allows use of the Denver boot on a Ford Explorer or Nissan Pathfinder which have these extended hub axle shafts. Expo1000 - Will you explain your “Super Boot”? Liz Wolfson - That was designed specifically with the “mega” trucks in mind – like the Ford 250 or Ford 350 with oversized wheels and tires. 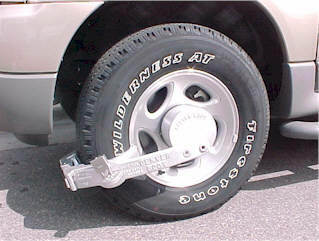 The huge wheels may have as many as 12 lug nuts while normal cars have 5. Expo1000 - I see that the boots are unpainted? Liz Wolfson - Yes. The boots are foundry cast in an aluminum alloy. They are very strong and will not rust. No paint is required to protect the boot. Some customers have opted to paint the boot for additional visability but paint is not necessary. We've seen 30 and 40 year old used boots that look new. Expo1000 - Is the Denver Boot a major part of Clancy’s business? Liz Wolfson - No, not at all. It’s just an important facet of our parking enforcement solution. The “Denver Boot” is a very well knows brand. It’s referred to in all countries – it’s talked about in South America, Europe, even Russia and Hungary. A week doesn’t go by when there isn’t a story on TV or in a newspaper which mentions the “Denver Boot”. 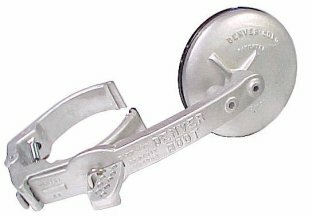 Folks may not know “Clancy Systems” but almost everyone knows the “Denver Boot”. The “Denver Boot” has become a common term, it’s even in the dictionary. It’s a great, well know brand – like “Kleenex”, “Jello”, and “Xerox”. 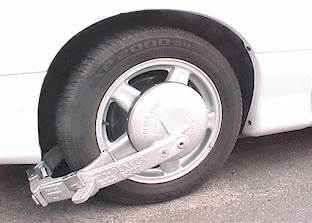 Expo1000 - Is the only use of the Denver Boot to immobilize violators who haven’t paid their parking tickets? Liz Wolfson - My experience is that more cities are using it now than eve before. A few years ago, very few cities had booting ordinances. More and more cities are starting to boot. Now many smaller cities are passing booting ordinances and beginning to use the boot. Expo1000 - Sounds like a new – old idea. Liz Wolfson - Right. It’s also become a very important device to help secure non police enforcement vehicles where you have trailers on construction or cell sites and where vehicles are left unattended for long periods. People want to put these on these special mobile equipment trailers and vehicles for security. 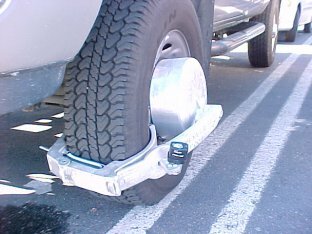 Even though a boot isn’t the ultimate security device, it slows down a thief who may want to steal a vehicle. It is a deterrent – very much like a dead bolt lock on a house. During a theft, getting in and out in a hurry is critical. The boot makes a quick in and out impossible. Expo1000 - How do you market the Denver Boot? Liz Wolfson - The Internet is the best marketing tool we have. While not every product can be sold on the Internet, the Internet and the Denver Boot seem to be a perfect match. Expo1000 - Can we come back sometime to talk about other Clancy products? Liz Wolfson - We would be delighted. In my opinion, Expo1000.com is great tool for our company, our clients, and potential clients.